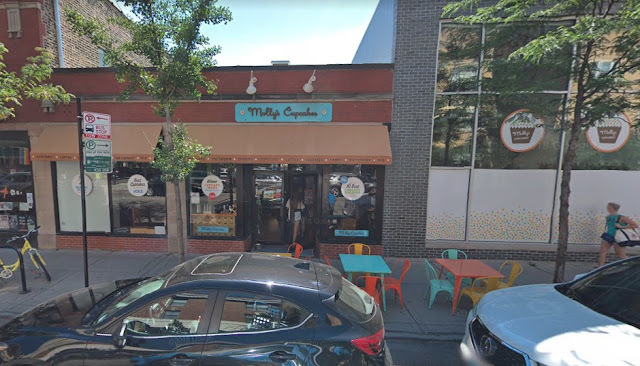 Molly’s Cupcakes, the beloved bakery at 2536 North Clark, became the latest North Side business to fall victim to burglars early Tuesday, police said. Cops responded to the recently-expanded store around 3:30 a.m. to discover “glass everywhere, the register open, and the office ransacked,” an officer said. The store’s safe was targeted. Investigators said the back door had been busted to gain entry. • House of Smokes at 2917 North Broadway. A worker found security camera wires cut and the register opened with inventory and cash missing when he arrived to open the store on Nov. 21st. • A small retailer in the 1400 block of West Fullerton on Nov. 17th. • A dry cleaner in the 3300 block of North Racine on Nov. 7th. Force was used to gain entry to all of the businesses, according to police records. After-hours break-ins have been a nagging problem on the North Side for several months. In a string of community alerts, investigators have encouraged companies to make sure that their surveillance and alarm systems are working. Police have also recommended the strengthening of rear doors.